1. A children's home near Altao Paraiso that is run by the Paulo de Tarsus group. It was set up by the amazing Dona Romilda and her husband, both of whom are in their 80's now. When they married as teenage sweethearts they promised each other they would devote their lives to helping the children, and that is what they have done now for over 60 years. Their children and grandchildren now all help as well as a team of 15 professionals (including teachers and a psychologist) and volunteers and the work is largely funded by their own family farm which grows the food for the children and runs a small timber business. The home cares for 60 children on a daily basis, providing creche and day care facilities for kids whose parents otherwise could not go out to work - so it is a vital service to keep those 60 families financially afloat. The children receive a nutritious lunch, education and most importantly a lot of LOVE. The home also looks after many children and babies whose families are in crisis and unable to look after them - perhaps temporarily and perhaps permanently. Those children are sent to the home by the courts and everything is supervised by social workers - and some of the children are street children who have no family at all. Our local team led by Ivan is staying in close contact with Dona Romilda and her team to give them all the support we can and to help them become sustainable as they move into what looks like a challenging future in Brazil. 2. Ivan introduced us to Jhenife, an amazing 13 year old girl who lives about 10km along a jungle track. Jhenife had the idea of making a Library for the local children. Ivan is helping her - and now we are too! You can see some photos of her simple home, lovingly hand built by her father from mud bricks, where she keeps over 400 books for local children to borrow. When I asked her if there was anything she would like, she replied "Yes, a little building for the Library so the children don't have come through my bedroom and be in this small dark room." This incredible child, who lives in such rural simplicity that there is not even glass in the small window of her bedroom, asked for something for the others, and nothing for herself. Jhenife wants to become a lawyer and I have no doubt she will be! She is a very remarkable human being. We are working together with Ivan and his local group to build Jhenife's Library. Another 1,000 books have already been donated, and so it is planned to set up 2 more similar "jungle libraries" in other locations. 3. Our third project is further north in the Manaus area of the Amazon rainforest. There many tribes have come together to live on the edge of the forest, from which they are being squeezed. 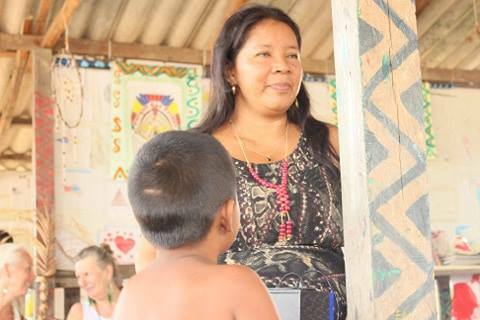 One amazing woman, Claudia Barre, has brought all the different tribes together who all speak a different language - and she has created a School for the tribal children. The school is very simply built - just some wooden pillars, a roof and a mud floor - but 80 children are attending and it has become a kind of community centre too. 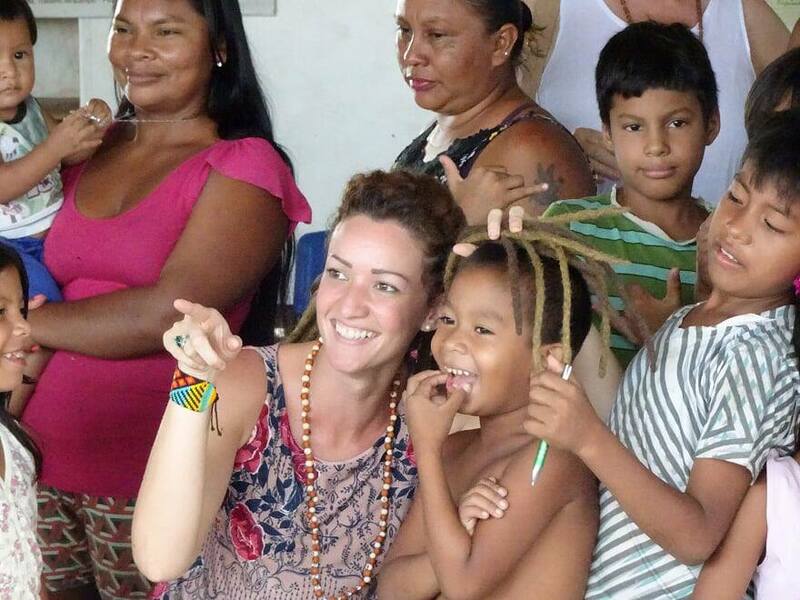 The wonderful thing is that although Claudia is a qualified school teacher within the Brazilian system, she is teaching the children about their own tribal culture, using the tribal lingua franca as well as teaching them Portuguese. Their current project, which is supported by the University of Manaus, is to learn all about the medicinal properties of Amazonian plants, trees and herbs and to teach and share this information. When we asked Claudia what she needed she said a computer - not a new school building, not new chairs or any other thing we may have thought of. She needs the computer because she has 4 books of teaching material that she has written by hand and has so far been unable to share with the children. We have already presented her with a new laptop and she is already transcribing and printing her 4 teaching books for the children. We are in close contact with Claudia and our local team there, Luiz and Ana Carolina, so that we can continue to give whatever support we can. As always, I humbly bow to you all <3 and thank you for all your continuing support and love and contributions that enable us to continue with these kinds of small projects which make a huge difference to many lives. After Christmas I will be travelling to India and to Sri Lanka for Heart Of Living Yoga and our projects there - so I will send you some more news about that in the new year. I will be away until the end of March, so please bear with me and be assured the work is continuing even if you don't hear from me! And some Stop Press News! just in - we are very grateful to have just received an initial grant from the national lottery to bring Heart yoga and mindfulness into 4 schools in deprived areas of the U.K.
On behalf of the children, thank you all again and again and again.